Power Industrial Controls designs and manufactures custom electrical control panels for a variety of equipment and machinery. Whether you have a design already made, or need everything from consultation to design to manufacturing and installation, we can do it all! 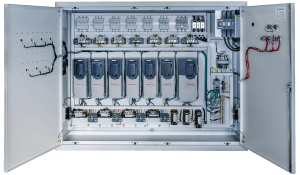 Our engineers can work with any application from small wall-mounted panels with minimal functionality to large control cabinets with complex operations. 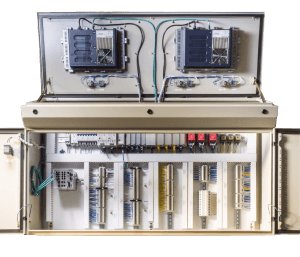 We have the ability to rebuild existing control panels, replace broken parts, or upgrade components to meet new compliance standards. We use cutting edge software to design control panels along with automated equipment to replicate those designs precisely and accurately. Request a quote and speak to one of our panel shop engineers today!